The GeoPRISMS Program is offering two $500 prizes for Outstanding Student Presentations on GeoPRISMS- or MARGINS-related science at the AGU Fall Meeting in Washington, DC December 10-14, 2018. The two prizes, one each for a poster and an oral presentation, will be awarded to highlight the important role of student research in accomplishing MARGINS- and GeoPRISMS-related science goals, and to encourage cross-disciplinary input. Any student working on science topics related to the objectives of MARGINS or GeoPRISMS is eligible to participate. Students do not have to be working on a MARGINS- or GeoPRISMS-funded project to enter the competition. Students from the international community, as well as from the U.S., are encouraged to apply. 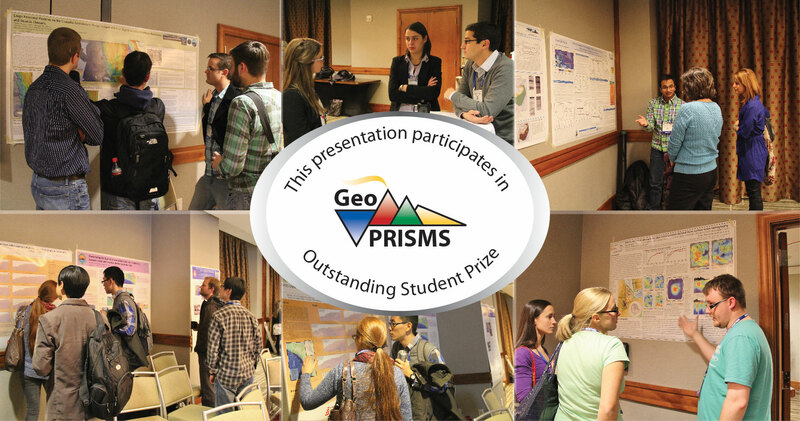 Please note that previous GeoPRISMS Student Prize winners are not eligible. Presentations will be judged throughout the AGU meeting. Students are also highly encouraged to display their posters – or poster versions of their AGU talks – at the GeoPRISMS Townhall and Student Forum, beginning at 6:00 pm on Monday, December 10 at the Kimpton Hotel Monaco (700 F St NW, Washington, DC 20004 icon-external-link.) This is a great opportunity for students to share their results further, to interact with a wide spectrum of GeoPRISMS scientists, and to hear about upcoming events and opportunities. Students can read below the Suggestions for an effective presentation for presentation tips and check out the past winners. Further details about applications will be coming soon on the GeoPRISMS website and will be advertised on the listserv. Students who wish to participate in the GeoPRISMS Student Prize at the AGU Fall Meeting 2018 need to apply before November 18, 2018. Highly qualified judges volunteer their time to evaluate students’ presentations throughout the meeting. Their expertise helps evaluate good science, and contributes to the success of the Student Prize competition. Do not hesitate to contact the GeoPRISMS Office for any questions related to the GeoPRISMS Student Prize at AGU Fall Meeting. Thank you!